Bank holidays are a busy time when thousands of motorists traditionally take to the road to enjoy a long weekend away, whether in the UK for a staycation or for a trip abroad. The Motor Ombudsman, the automotive dispute resolution provider, has some guidance to help keep your car safe for any journey ahead. Tyres, whether winter or run flats, are a critical part of road safety. As there’s only a small contact patch separating your car from the tarmac, it’s important that they are maintained to the correct standard and do not become worn beyond the legal minimum tread depth of 1.6mm. Inserting a 20p coin into the tread of the rubber is a quick and easy test to determine whether the depth is above the required limit. If the outer band of the piece cannot be seen when it’s inserted, then the tread is sufficient. Furthermore, look out for splits or bulges, as any high temperatures can worsen any existing damage to the rubber. It is recommended that tyre pressure, including that of the spare if there is one, is checked at regular intervals. Under-inflation, which a tyre pressure monitoring system (TPMS) should indicate on the dashboard, has an impact on wear, handling and grip, especially during periods of inclement weather, which can affect driving conditions during a bank holiday weekend. Fluids and lubricants lie at the heart of a vehicle to keep it functioning correctly. Therefore, take the time to check that oil, as well as the washer and air conditioning fluids, are all topped up to the levels specified by the vehicle manufacturer. Keeping all front and rear lights clean, and in good working order, is essential for them to be fully effective, especially when travelling in the dark or when visibility is poor. Do not fill the fuel tank completely, especially on hot days. As with most liquids, fuel will expand, and this could lead to it leaking out of the filler neck of the tank or breather. With prices at the pump on the rise, you can take a look at online comparison sites as to where the cheapest unleaded, diesel or LPG can be found within a chosen area. Also, try not to use the air conditioning for the whole duration or your journey, and only turn it on once all doors and windows are closed. Furthermore, it’s best to turn it off once the air conditioning has cooled the inside of the car to reduce fuel consumption. Electric and plug-in hybrid cars are becoming increasingly commonplace, and therefore, if you drive one of these models, it’s important that know where the charging points are along your route, whether in the UK or on the continent. Plan how many miles you are looking to cover, what the distance is between charging areas, and if your accommodation has points available so that you can replenish the battery overnight if needed. Equally as essential is the health of your battery as it powers the car’s electronic systems. If it’s apparent that your vehicle is proving difficult to start, and the battery is more than five years old, you should look at getting it replaced, as a flat battery is one of the main causes of breaking down. This will help to avoid any unnecessary interruptions to journeys during the holiday period. Before you set off, make sure that all paperwork is up to date, to stay on the right side of the law. This includes your breakdown (rescue) and insurance policies, car tax (Vehicle Excise Duty) and MOT certificate. 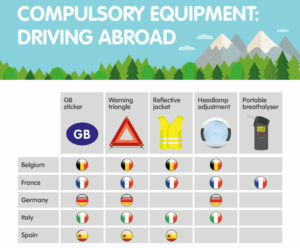 If you are thinking of going across the channel, road laws vary by country as to what equipment you need to carry in the car. For example, in France, a portable breathalyser is required. Nevertheless, for those crossing the channel, a GB sticker on the back of the car is essential, unless the registration plate displays the GB Euro-symbol. However, for all travel beyond the UK, it is advisable that a warning triangle, high visibility reflective jackets and headlamp beam converters are kept in the boot as a minimum. Take a look at the graphic below to find out more. With coin operated barriers fast disappearing from UK roads, make sure that you visit the relevant websites to settle the fee if you plan to pass through any toll booths or congestion charge zones. Similarly, when travelling abroad, make sure that you have loose change or a credit card to hand before setting off. Need a garage for checks or repairs? If you need to find a garage to check the condition of your car before going away on a bank holiday, or are looking to have any repairs done, then you can use our online Garage Finder to find your local Motor Ombudsman-accredited business quickly and easily.